A few years back I wrote a 3-part series for FF2 Media called Pulchronomics 101 in which I showed how physical beauty affects women in the workplace -- often determining their success or at least making the road a little easier -- using movies and cable news stations as my examples. 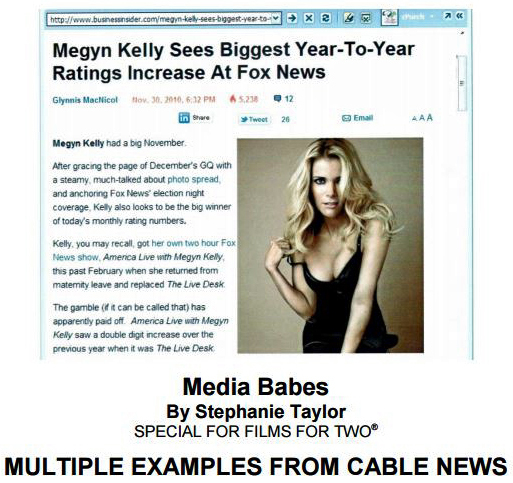 In the part called "Media Babes," I ranked the three of the big cable (CNN, FOX, & MSNBC) comparing their rating based on how attractive the female anchors were. Looks like someone thought he was more self-entitled than he had any right to be. And as you can imagine, Ailes is denying any wrongdoing, and in the USa people are innocent until proving guilty, but we've seen this show before (mostly recently in the Bill Cosby case). The bigger they are the harder they fall. So... there's another "legendary" career down the drain. Click HERE to read more details in the Washington Post.